A gas cloud from one of the largest flares ever seen on the Sun has reached the Earth causing a magnetic storm that erupted and then faded quickly. The disruption to the Earth's magnetic field was described as very severe. Aurorae - polar lights - caused by the charged particles from the Sun have been seen at night all over the globe. The Sun is undergoing a surge of activity and currently has several large sunspot groups on its surface. More flares and disruption is expected. 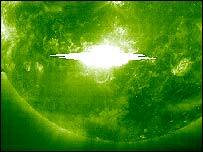 According to scientists the flare is the third largest detected since regular solar monitoring began 25 years ago. It is the strongest flare since 2001 which itself was the most powerful since 1989. A less powerful flare, also in 1989, caused disruption of power grids in Canada. 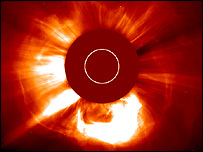 Observations from the Solar Heliospheric Observatory (Soho) satellite, monitoring the Sun from a gravitational balance point 1.5 million kilometres closer to the Sun than the Earth, saw the so-called coronal mass ejection (CME) rise from the Sun on Tuesday. Estimates of its velocity suggested it was moving at 7.5 million km a hour, about five times faster than usual. Soho astronomer Paal Brekke said: "The magnetic cloud slammed into the Earth's magnetosphere and created a G5 geomagnetic storm, the strongest category." However, monitoring suggests that the storm weakened quickly. Experts say this weakening was probably due to the CME's magnetic field which had a northward pointing magnetic component. Had it been pointing south, they say, the result would have been a much more severe and long lasting geomagnetic storm. This is because if a CME has a magnetic field pointing south it interacts more violently with the Earth's magnetosphere. "So we were quite lucky," said Dr Brekke. The geomagnetic storm has caused compasses to swing wildly. 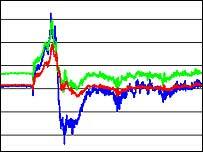 The compass variation at the Lerwick geomagnetic observatory in Scotland changed by 5.1 degrees in only 25 minutes at about 0630 GMT. Japan's space agency has announced that its Kodama communications satellite has been affected by the flare. It has been shut down with the hope it can be reactivated when the storm has passed. Aurorae have been reported from mid-western US. Observers say they have seen "lots of red streamers with almost daylight blue down on the horizon". "For the second time this week, a huge magnetic storm sped towards the Earth"